I have no information about this man, although I am assuming that he was a friend or "suitor" of one of my Witt or Rhodes ancestors in Nelson County, Virginia, as these pictures were found in a box containing other old family photographs. UPDATE: The following was sent to me by a Yancey researcher who gave me permission to post her information. 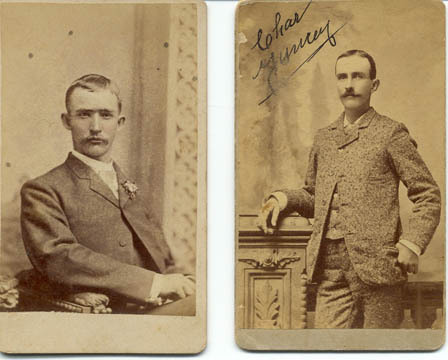 The style of dress of this individual certainly places him between 1850 and 1900. At that period of time, as far as I have been able to determine, there was only one Yancey family in Nelson County. They were the Joel Yancey family from Albemarle. Joel was there in 1860, and had recently lived in Albemarle, where he was born, the son of Jeremiah Yancey, the son of Charles Yancey. In 1860, he is shown with his wife Isabella, (Isabella Turner, daughter of Henry Turner and Isabella Hopkins). Isabella had been born in Nelson co. They have several Children, Luvenia Yancey, (the wife of George A. Coyner of Augusta Co.), William H. Cornelia, and Charles. I think the last mentioned child is certainly the one in the pictures. He is still residing in Rockfish, Nelson county, with his mother Isabella, and brother William H, in 1870. In 1900, his mother is gone, and his brother William H. is living on the family property.